Jane Austen’s works have not only inspired countless movies, Tv adaptations and books, but every sort of item you can think of. Mugs, t-shirts, table games and jewelry are just some of the goodies that feature either the image of the famous novelist, pictures of her characters or quotes from her works. If she were alive today she would be stinking rich from the royalties! Is Pride and Prejudice one of your favourite books? Have you read it dozens of times and think you know everything there is to know about it? 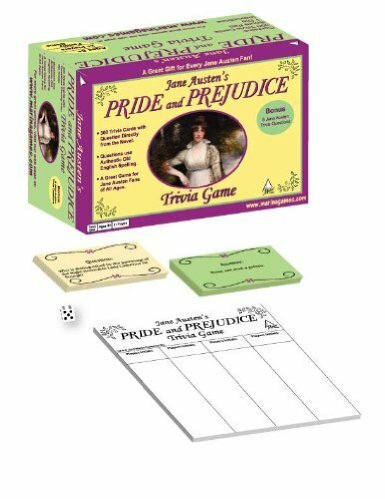 Then put your knowledge to the test with this Jane Austen’s Pride And Prejudice Trivia Game ($14.99 on Amazon). It contains 300 trivia cards, including 8 bonus Jane Austen trivia questions, a dice, score cards and instructions. 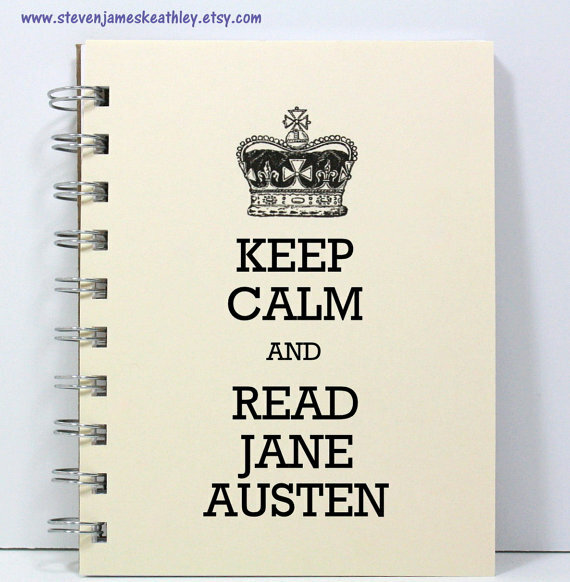 It’s a great way for any Janeites to spend an afternoon. Did you hurt yourself? 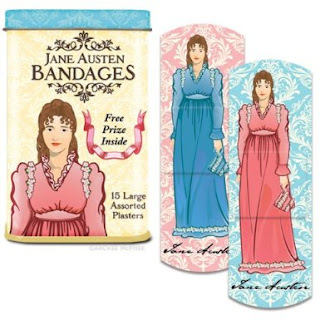 Then protect your wounds, and cheer up your mood, with these cute Jane Austen plasters. Each box contains 15 bandages featuring an image of Jane Austen (ok, it doesn’t look much like her, but it’s still a pretty picture, isn’t it?) or quotes from her books. They measure 7.6 cm x 2.5 cm and are available at Amazon for $6.50. Start the day with a sip of your favourite novel. 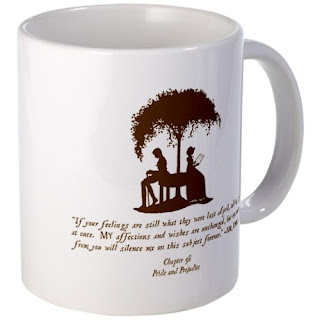 This Pride & Prejudice Mug, which measures 3.75″ tall and 3″ diameter, features an image of Mr Darcy and Elizabeth Bennet sitting under a tree, and a quote from the novel. You can purchase it at Cafepress for $12.99. 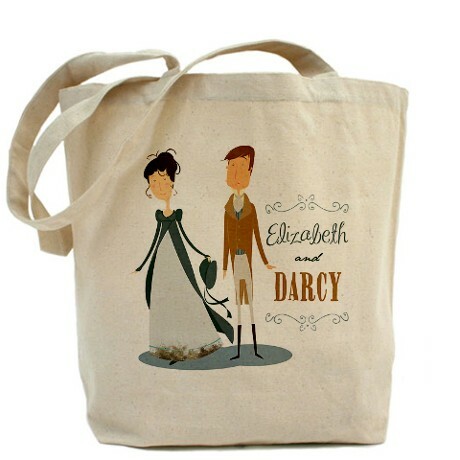 How adorable is this Elizabeth & Darcy Tote Bag? Made of 100% cotton, it has plenty of room to carry everything you need when you are on the go. Plus, it features a quote from the novel on the back side. 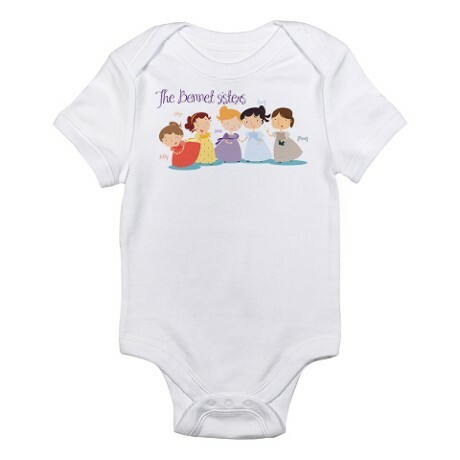 It is available at Cafepress and costs $14.99. 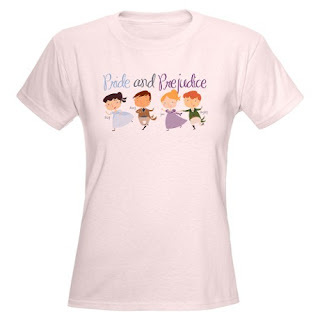 I adore this cute T-shirt which features images of the main Pride & Prejudice characters as children. Made of 100% cotton, it is available in Light Pink, Light Yellow and Light Blue. You can buy it at Cafepress for $13.99. An adorable body suit for an adorable little Janeite. This 100% cotton jersey knit Infant Creeper is comfortable, allows babies to move freely and its three-snap bottom helps ease those nasty diaper changes. It is available in Cloud White, Kiwi, Petal Pink and Sky Blue. It retails at $18.00 at Cafepress. 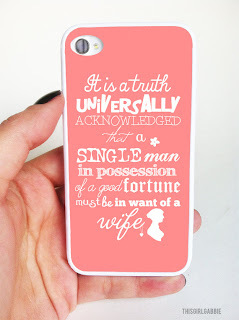 This cute pink plastic iPhone case featuring the famous opening line from Pride & Prejudice makes me want to buy an iPhone. Just so that I’d have an excuse to buy the case too. If pink ain’t your thing, the case is also available in Mint Green and Gray. It retails at $28.00 and is sold by This Girl Gabbie on Etsy. Don’t you often wish you were at Pemberley too? 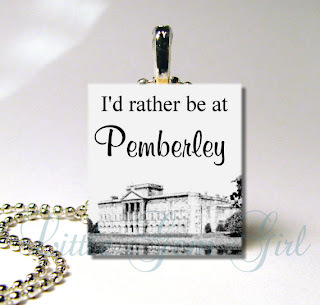 Now you can let everyone else know it too by wearing this cute “I’d rather be at Pemberley” pendant. Available in Black or White, it is sold by Andrea on Etsy and retails at $7.95. 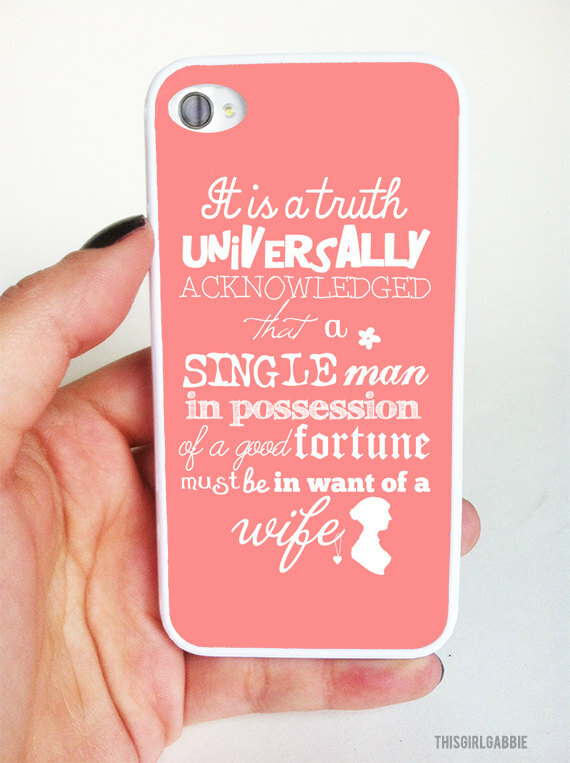 NESoaps has created a series of soaps inspired by Jane Austen and her novels. Emma Woodhouse is scented with citrusy tart yuzu and sweet orange. Elinor has a fresh, mild, clean scent that evokes herbs and mint. Marianne’s Passion is scented with black raspberry vanilla. Sweet Jane (Bennet) smells of lemon verbena. Finally, Mrs Darcy has a floral plumeria scent. 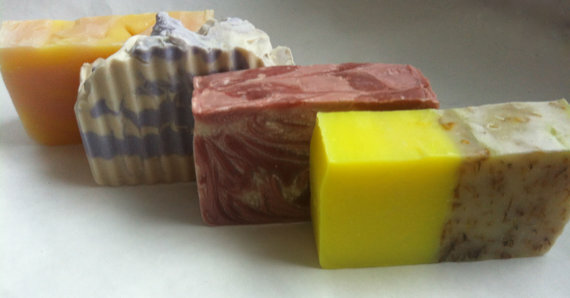 You can buy all the soaps together for $22.00 or separately for $5.00 each. Don’t fret book lovers. 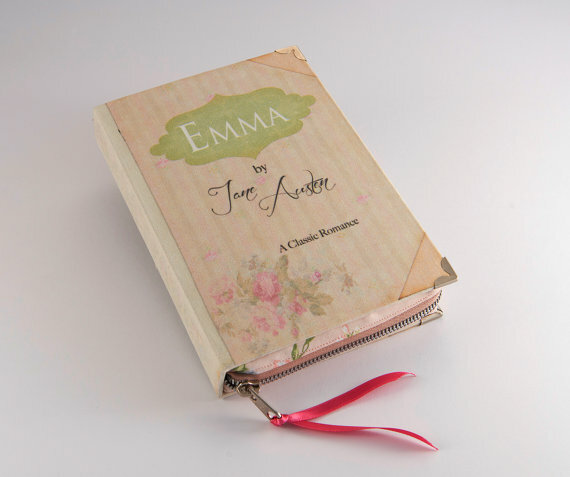 This adorable and feminine clutch is not made with a real book. The cover is made of cotton fabric, binded, as a normal book would be, and finished with silver metal corners to embellish and protect the clutch. It’s original, smart chic and the perfect gift for anyone who loves books. It is sold at psBesitos and costs $79.27. 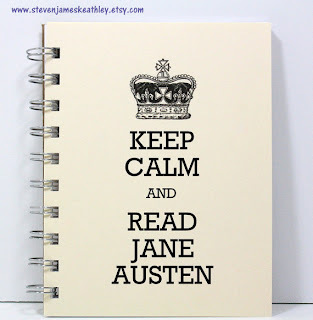 This handcrafted journal features the words “Keep calm and read Jane Austen” on the cover, which is printed on ivory cardstock made from ecofriendly recycled paper, and 60 sheets (120 pages) of white, unlined paper. It is bound with a sturdy double coil wire, a convenient feature which allows the inside pages to lie flat when you open the book. Convenient and ecofriendly, it can be purchased at Steven James Keathley’s shop on Etsy and costs $8.95. If you love chocolate (and who doesn’t? ), you won’t be able to resist this set of six chocolate boxes inspired by Jane Austen’s novels. Each cute box features a quote from the book it is inspired by. The chocolate is available in the following flavours: coffee beans enveloped in dark chocolate; almonds enveloped in white chocolate; strawberry enveloped in dark chocolate; peach enveloped in dark chocolate, orange enveloped in dark chocolate; and blueberry and pomegranate enveloped in dark chocolate. 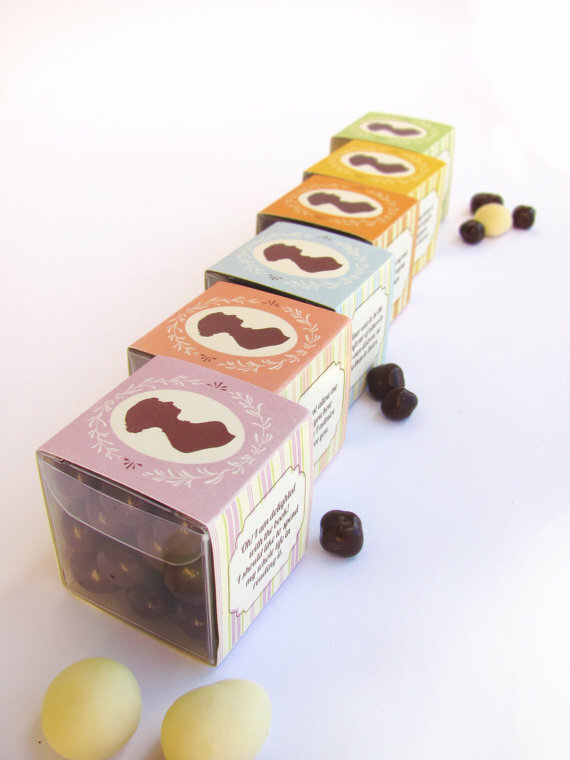 The set is available at PemberleyPond and retails at $33.03, but most flavours can be purchased singly for $7.93. What do you think of these goodies? And if you’ve found any other Jane Austen related items, please share them with us!